When I left off in Part 1 the tower was 70' high and had the first two sets of guys attached. From here on upward required a change of strategy. The equipment I used to get this far was no longer suitable. I needed power and I needed additional help on the ground. There are also considerations for working at height that are usually not required for smaller towers. The increase in difficulty and tooling does not increase linearly with height. That is, twice the height is far more than twice the challenge. In this article I'll focus on the differences in technique to get from 70' to 150'. And get there I did, as you'll see. Not having a suitable off-road vehicle or truck handy, unwilling to ask a friend to risk their vehicle, and unimpressed with the cost of renting or buying suitable power equipment I decided I would drive my low ground clearance car into the hay field to power further lifts. With this much power and momentum the lift must be done carefully. A snag can result in damage to the tower, guys or gin pole. Slow lift speed is mandatory, as is a person on the tag line and everyone being very observant. The car was operated in reverse for maximum visibility and communication. One important addition was a pulley as close to the ground as I could get it. The purposes of the pulley are to ensure the forces on the gin pole are entirely vertical and to allow rope attachment to the tow hooks, without risk to the vehicle body. The pulley was attached to a short length of EHS tightly wound on the concrete tower base and scrap lumber in between to avoid abrasion. Cars are not tractors. I used fabric tow straps to be especially kind to the vehicle body and shackles for fast, reliable connection and disconnection. I tested the system with my own car and successfully raised one section on my own. Notice that the car faces the tower and lifts in reverse gear. The driver has a full view of the area and crew communications is easier. In addition to the tow hooks at either side my car also has a centre hook which was more convenient. On other vehicles we used the driver side tow hook since it puts the rope directly in front of the driver. There is no reason to centre the force on a vehicle for a lift of 120 lb since it has ample power and traction wherever you attach. I had a few concerns with a vehicle lift. First was the hay field itself. I carefully chose a path that was free of surprises so that the driver can focus on the forward view. Second was what would happen when snags occurred during the lift. Again this wasn't a problem. There was excellent "feel" through the throttle when snags occurred. Nothing was forced and nothing was damaged. You simply drive forward and the crew assesses the situation and takes action. Third was my car's manual transmission. An automatic is far better at this task since the smooth torque adjustment avoids jerky motion and there is no risk of clutch overheating. One friend suggested turning the vehicle off when not actively working despite losing the comfort of the air conditioning since catalytic converters get very hot and could start a grass fire. 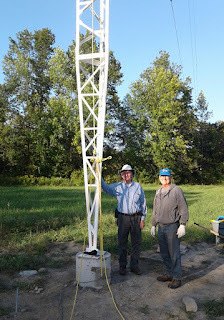 In addition to tower sections we used power to lift the upper guys. They are heavy. For lighter items it was easier to used the same rigging and muscle, not a vehicle, to do the lifting. You simply pull the rope while walking away from the tower base. Lifting 150' requires more than 300' of rope or cable. The tag line must be as long as 200'. I had to make a decision whether to use steel aircraft cable or rope for the lifting. The tag line is easier, ending up as two 100' ropes joined with simple knot. Rope and steel each have their advantages and disadvantages. I'll mention a few of these here. To meet my minimum working load of 200 lb (90 kg) I could use a variety of ½" diameter synthetic fabric ropes (1,200 lb breaking strength) or ⅛" aircraft cable (2,000 lb breaking strength). I already have that amount of new unused aircraft cable. The longest rope I had was 200' of ½" nylon. Aside from working load there is value in going to wider diameter (and expense) to avoid tangling and to lower breakage risk due to abrasion. My ultimate choice was perhaps an odd one: ½" polypropylene twist rope. A 335' (105 m) roll was so inexpensive as to be disposable. It is also very light and easy to handle. The weight is a factor when one man is lifting the gin pole up a section with perhaps 250' hanging off the top pulley. Its bright yellow colour and thickness make it very visible. This is very helpful to spot problems before beginning a lift operation. Steel cable and rope are weakened by knots and sharp bends. I used shackles to connect the tow strap to the car and to the rope for rapid connects and disconnects and to avoid rope damage from the sharp edges of the steel hoops on the tow strap. The rope is wrapped several times through the shackle before tying the knot so that the residual tension on the knot is small. 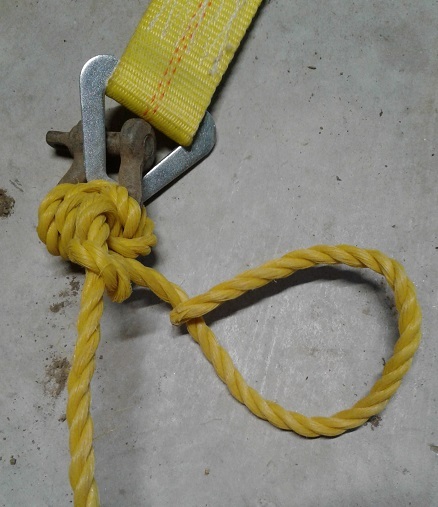 Undoing the knot is easy in comparison to one traversal through the shackle where the full tension of the load can make the knot exceedingly tight and difficult to undo. If aircraft cable is used a thimble and at least two clips are required. If you try this yourself with polypropylene twist rope there are a couple of things to beware of. First is that the new rope kinks easily, even when properly unrolled from the reel. Removing the kinks is aggravating. Once the rope has been under load the kinks tend not to return, so it is a short term difficulty. The second problem is that for long lifts the twist transmits a torque to the load. The person on the tag line will find it difficult to keep the load from doing a partial spin. With a light load where the rope has more freedom of movement the tag line keeps the load from spinning and tangling with the rope. Braided rope is better though more expensive. But I wanted a cheap way to test a vehicle powered lift that may not have worked at all. Now that the rope has been "de-kinked" I can use it for tramming antennas and other tower tasks. There was a delay after my test lift while I recruited and scheduled ground crew. The tower stood at 80' for more than a week. Meanwhile I was busy ordering more guying hardware. I had made a calculation order and found that I did not have enough pre-forms. Somehow I forgot to account for the guy section between the bottom strain insulator and the turnbuckle. After looking over another ham's big towers and recalling an article I'd read somewhere I realized it would be a good idea to add another non-resonant segment to the upper two sets of guys. Otherwise the bottom segment could resonate on one of the low bands. Being so far out from the tower and more vertical than horizontal it would have no impact on tower mounted yagis, which is why I did not at first consider it. The lower segments can interact with low band vertical antennas within ½λ and even 1λ. On 80 and 160 meters that would be a distance of between 40 meters and 160 meters. I decided to add a 43' section on those 6 guys to ensure no low band resonances with my planned locations for low band antennas. I will admit that I often free climb towers. That is where you climb a tower without a fall arrest system, relying solely on your hands and feet to climb and a positioning belt and lanyard to buckle in when working. This is terribly unwise although most of us can get away with it when towers are of modest height. I know many hams who will never climb without a fall arrest system. It's slower but safer. Climbing (and descending) 150' takes a long time and can tire you if you are not fit and fresh. Mistakes happen when you're tired. This tower was a call to upgrade my safety equipment. First I did research online and in stores and talked to professionals who told me and even showed me what they use and the advantages and disadvantages of various systems. Provided the equipment was certified for tower use it mainly came down to comfort, fit, money and convenience. 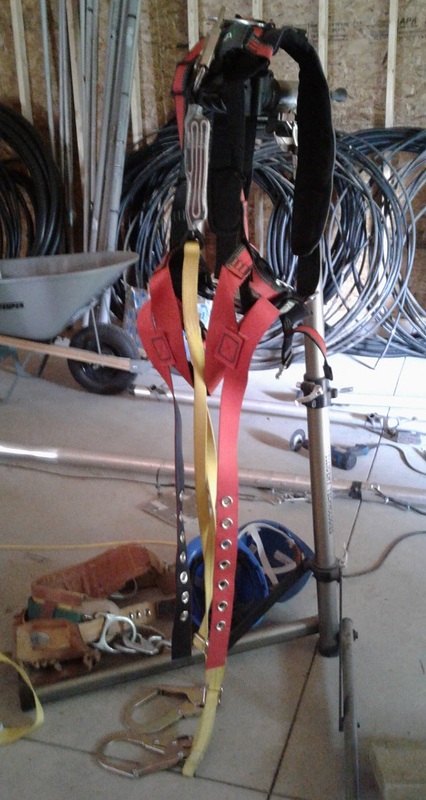 My fall arrest harness is typical, middle-of-the-line equipment. I purchased it from an Ottawa store that caters to trades and utilities, and stocks a wide range of products. The salesman was able to discuss their features and then let me try them each on. Since I climb in every season he recommended the grommet straps so that I can adjust the harness each time to accommodate one or many layers of clothing. After several weeks use I can say that I quite like it. The double lanyards are large enough to grasp almost all tower steel yet are easy to manipulate. The positioning belt goes over the harness. I learned the importance of placing tool pouches and other appurtenances out of the way of the long lanyards. There is more to safety than a fall arrest harness. Communication is slower and more garbled between rigger and ground crew. I make a point of rehearsing procedures with my crew and ensuring that they know how to use the tools and equipment involved. A fellow ham loaned me a set of portable radios for communication, which we didn't use. Hand signals were faster and easier. Just be sure everyone knows what each signal means! Hard hats are mandatory for ground crew and most often on the tower when there's steel overhead. I dropped enough parts and tools to make everyone a believer! Heavy duty work boots and protective clothing were strongly recommended for everyone on site. That amateur radio is a hobby is no excuse for a casual approach to safety. I can raise towers on my own when I have to. Doing so isn't advisable due to the lack of backup, the need to make minor adjustments by climbing up and down the tower multiple times and too much reliance on tools and machines. Most of the Trylon was raised on my own and smaller towers I have often done alone. I had occasional help getting to the halfway point with this tower, and that is as far as I could go without a ground crew. My experience is that when the height is over 20 meters a crew is mandatory. Doing without is a serious safety risk. Experience and expertise are not enough. Don't work alone! Driving the vehicle doing the lifting. Using the tag line to guide the load around obstacles. Rigging sections and other items for lifting, then retrieving the haul rope. Pulling guys for connection to the anchors. Several pairs of eyes looking out for problems and to alert others. When it went really well I could climb the tower once to attach multiple sections and guys, leaving all the work on the ground to others. I am fortunate to have friends who can come out to help. It isn't easy for them since my location is far away from everyone. 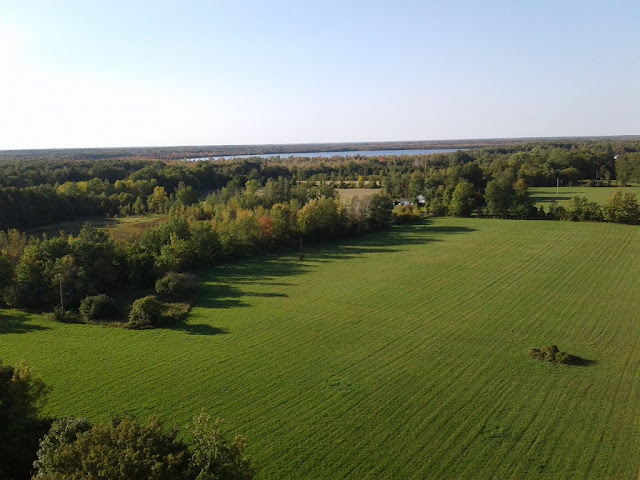 Others near and far provided advice and recommendations along the way based on their experience building and maintaining large antenna farms. Most notable has been John VE3EJ. No ham is an island. When for a time I was having difficulty recruiting a crew and my new lifting system was untested I contemplated having the rest of the job done commercially. Indeed friends encouraged me to do so. Quotes were solicited. Professional firm that serves the public wireless industry and private wireless systems. They provide the crew and equipment while you watch and write the cheques. Individual rigger on his own time or as a business. In the former case the work is done on weekends. You provide the ground crew or they hire and you pay. Ham supplier who sends someone out who may be no more experienced than you. But at least the assistance provided is helpful. Make sure they're insured against hazards. The first option is the best and safest, and is the most expensive. There are numerous certifications and safety practices they must comply with. This means a bigger crew and carefully executed process that adds man-hours to the project. The last option is, in my opinion, the riskiest. However all can result in a successful project. A big challenge with the commercial option is that all material must be prepared in advance. Guys must be fully assembled, all parts must be on hand, machined steel components must be ready to go, and their equipment must have safe access to the site. This is difficult for the typical ham to manage, and I am no different. Miss something and you pay while the crew sits around or leaves and come back another day. 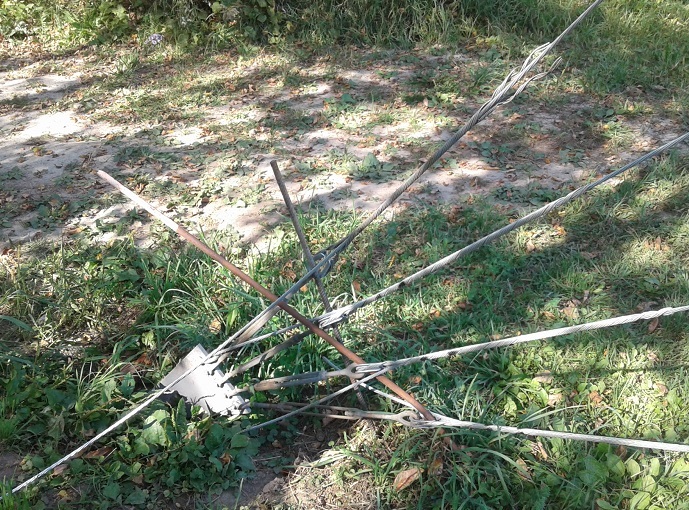 If you have the money and you want a painless path to a big antenna farm by all means call the professionals. For myself I prefer to do and learn by doing. That's part of the fun of amateur radio. Dangerous, too, but then so is the inside of a kilowatt amplifier. Do what works best for you. I dropped the tag line to take this picture of how the lift is done. Craig VE3OP worked HF during idle periods. During the time that hurricanes Harvey and Irma were devastating the southern US the weather here was unbelievably pleasant. After a record breaking wet spring and summer the skies in September cleared and for nearly three weeks not a drop of rain fell. The only downside was the masses of biting insects that often made working in the hay field torture, especially in the hours after sunrise and before sunset and any time in the shade. Everyone dosed themselves with insect repellent. Aside from being terrorized by black flies and worse this was perfect tower raising weather. I rushed to capitalize on it. I called in favours and enticed friends to visit. Things began to move quickly again. First to arrive was Craig VE3OP. Between the two of us and his SUV we lifted three more sections into the air one fine Sunday afternoon, taking me to 110'. His careful handling of the vehicle ensured the smooth lifting and bolting in place three more sections. I handled all the tower work. With only the two of us I also served as ground crew for the lifts. This involved moving and rigging the next section, riding the tag line and looking out for trouble. Once the section was in position at the top I transformed into the tower rigger. I would climb up, work with Craig to slip the sections together, bolt them in place and finally move the gin pole up a section. Above 100' the view becomes quite impressive. On lower towers the view is often not great since you are typically not much higher than the trees. Even so I only gave the horizon the occasional brief glance. Time was pressing and my crew was waiting. Sightseeing can wait for another time. In the picture above right I am seen splicing the tenth section. 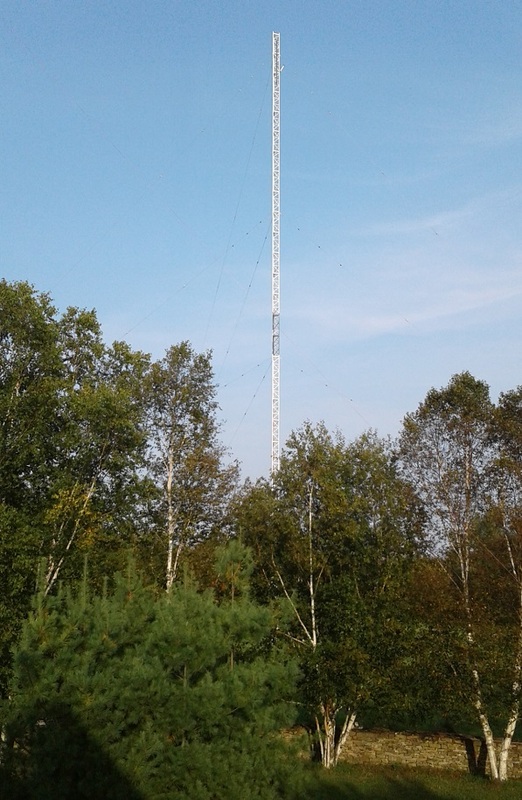 Aside from splice overlaps this put the tower at 100' (really ~96'). I like to say that a tower is similar to dimension lumber. That is, a 150' tower is 150' the same way a 2x4 measures 2" by 4". The next day I completed the third set of guys for the 105' level by lifting them in sections that were not too heavy. I then drew them out to the anchors and got them roughly tensioned and the tower aligned. By then it was late afternoon and no amount of repellent kept the insects from feasting on me. I ran for cover. I was in a rush to get the 105' guys installed since I had earlier arranged a two man crew to assist me the next day. It was necessary to get the tower tensioned and aligned before they arrived. To my surprise I discovered more settling in the 70' guys so I had to readjust those before finally drawing in the upper guys. This happens. Professionals always make one or two post-installation visits to align new towers. Since I was doing this task myself it takes one or two hours. The new crew were John VE3NJ and Don VE3DQN. Both are occasional contesters. 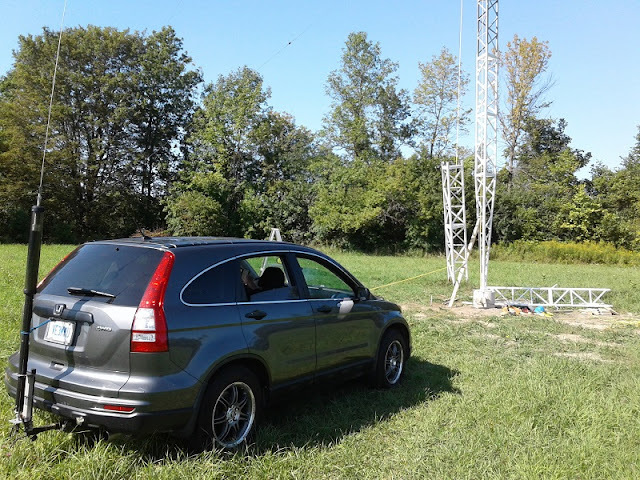 With their help (and John's car) we raised 3 more sections, taking the tower to 140'. I positioned the gin pole for lifting the final section and called it a day. We were all tired and the sun was going down. The insects once again swarmed in the waning daylight. Over the next few days I adjusted the guys and tower alignment and then raised the tension in the 105' level guys close to their final value. I had kept them ~500 lb until I was satisfied that the tower was properly aligned and the guys were unlikely to relax any further. Returning the lift rope to the ground became a problem. The weight of the latching hook and tow rope used to connect to the load were not enough to keep it from tangling or being blown over the guys. John suggested tying the tag line to the hook and letting them pull it down. A great idea that worked well. The tag line on long lifts must be very long. If the person handling the line is too close to the tower the angle of the rope is near vertical and the load cannot be effectively steered. The 200' tag line made it possible to stand far back from the tower to allow control of the load without unwanted stress on the gin pole. Unfortunately that distance made it difficult for the tag line handler to see how close the load was to the tower, guys and gin pole. The car driver was worse off being further distant. When I was up the tower for the lift I gave feedback on how the lift was going. On the ground I did the same by standing closer to the tower to see what was happening overhead. This is hard hat territory. The view from 140' towards Japan (north-northwest). South end of that field will be getting an 80 meter array. On the top set of guys I added a non-resonant section at the bottom to prevent 80 meter resonance with vertical arrays. 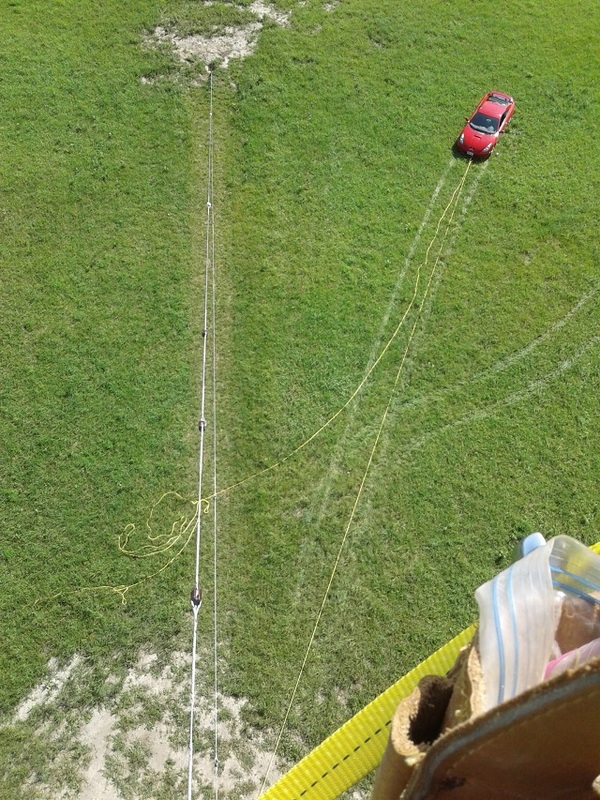 When they were attached to the tower I came down to complete the guying. I attached the reel of guy cable to the bottom insulator and my two-man crew pulled the assembly towards the anchor where I was waiting with the come-a-long. But it was too long! The insulator passed the anchor. How could I have made such a calculation error? The specification for the tower said that the top guys would be 207' and since I attached them 5' lower this should work out to ~203'. Yet I had only ~190' of guy to the bottom insulator. This was embarrassing. I told them to wait while I raced indoors to recheck the manufacturer's dimensions. It did indeed say 207'. Then I saw the fine print above the table. It was difficult to read since this was a PDF document made from images of the ancient paper document. The note said that all guy lengths include an additional 15'. Ouch! I removed the pre-forms and bottom insulator and continued with guy attachment. I suppose the lesson is to read the fine print or ignore the table and do my own calculation. The extra 500' reel I ordered was not needed. Perhaps I'll use it on my next tower. All towers move. Self supporting towers achieve their lateral stability from taper. Think of how much more resistant you are against a push when you stand with your legs apart. These towers will certainly move a little side to side when fully guyed. Lighter duty towers will unsurprisingly experience greater lateral motion for the same force. Many find the motion at the top of a self supporting tower. You get used to it or you don't, so it seems to me from my own experience and that of many other hams I've known over the years. Indeed that motion on self supporting towers is a common explanation for why some hams choose not to climb. Guyed towers move differently due to the use of straight sections. A self supporting tower made from straight sections moves far more than a tapered tower, at a frequency dependent on the tower structure, its height and the weight at the top (mostly you, the climber). Think of it as an inverted pendulum. It can be disconcerting. I know it was the first time I experienced it. A guyed tower wobbles in this way as it extends above a guy anchor during construction, which only disappears once the next guy set is tensioned. It can be worse above the second and higher guy stations since the top guy station acts as a fulcrum where the tower below bends like a bow and can sustain an oscillation for longer by whipping the upper unguyed segment back and forth. I've known professionals who hate the experience. The wobble is not a hazard unless it causes you to react inappropriately or you experience discomfort. Avoiding jerky motions reduces wobble, so move slowly if the wobble bothers you. One curiosity I experienced is that the rhythmic operation of a ratchet wrench on the splice bolts can cause an oscillation. This can be remedied by stopping for a few moments or by speeding up or slowing down arm motion to avoid the tower's resonant frequency. Once the tower is complete there is no wobble, but there is vibration. A steel structure under tension experiences relatively high frequency resonances. These come from the forces of the guys and the tower itself. As you climb lower, with more tower overhead the vibration can take on an almost ominous aspect. Although there is little motion you can sense from those vibrations the tremendous force the tower is dealing with. Respect it. After pulling in the top set of guys and aligning the tower I called a halt. The misalignment at 70' persisted and I wanted to deal with that before going to full tension on the top guys. The next day I took a slew of measurements and discovered a few anomalies. Most concerning was tension inequality among the bottom guys. One of them was at 1,300 lb. This was unexpected. My conclusion was that the difficulty might be at 35', not 70'. My hypothesis was that when I tried to pull the 70' level north to get the tower vertical I was fighting the guys at the 35' level, resulting in higher tension in the southward 35' level guy. I did a little more viewing of the tower from various positions and felt more certain of that, but also hesitant to proceed. There is a tremendous force on the lower part of the tower now that it's full height and the guys tensioned. This is not the time to make mistakes. Starting from the bottom use a transit (or suitable alternative) and get the tower centred on the base (vertical alignment). Don't worry about the guy tension until this has been done for all guys. The tower should now be straight and vertical. Adjust tension of all guys to specification. At that point the tension of all guys ought to be equal, within the accuracy of the tensiometer. As he reinforced, to do this properly really requires that the tower be vertical and a transit is needed to be sure. I followed his prescription and had success. One important change from my earlier method was to align the tower by the centre pin, not by the legs. Doing this made the 35' level misalignment apparent. Since I stuck it with my poor man's transit the tower may not be aligned to high precision. But it consistently tests and views as straight and vertical and that's more than good enough to allow me to continue with my project. At the end of the alignment process there is a bit of a rat's nest at the anchors. This is obviously the work of an amateur! Notice how the turnbuckles are not equally threaded. When the tower is aligned by the professionals this doesn't happen. The pre-forms don't go on until the tower is fully aligned and the guys at the correct pre-load tension. Without all those expensive tools more post hoc adjustment is required. The picture was taken with the tower aligned at the 145' guy level and before full tension was applied. There is still a sacrificial pre-form on those guys, and they are not fully wound to allow easy removal. This is not a risk since even without the top guys the tower is strong and stable; without antennas present the tower is only supporting its own wind load, and the weather continued fair. Steel rods are inserted through the thimbles to prevent the tension in the guys from changing. Turnbuckles and guys can unscrew themselves, and even a few rotations will ruin tower alignment. Once the guys are complete the turnbuckles will be locked with a length of EHS threaded through both the screw eyes and the turnbuckle bodies to prevent rotation. The turnbuckles will be painted or cold galvanized since the galvanizing on these old parts is no longer pristine. I would prefer to redo many of the guy terminations to place the turnbuckles screws at their midpoint. As they are right now there is less adjustment room, and some would argue that more thread should be inside the turnbuckle for safety in case of thread abrasion or corrosion over time. It is not an immediate threat, if a threat at all. I am deferring this task. It is good practice to replace pre-forms that must be unwrapped. 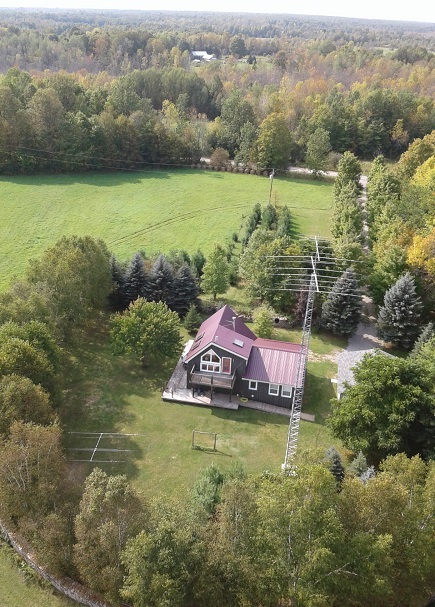 I'll close with a picture of my 70' (20 m) Trylon from the new tower. It provides an interesting perspective on what being up 150' is like. Consider that a tower of that height with a small stack of yagis is more than what most hams have. Put another way, you have to be a little bit crazy to go this high. The tower is as yet unadorned, not even so much as a mast. That's coming up.